The Primary Essentials asked me some very thoughtful questions about my work upon the arrival of my pieces in their Manhattan location. The original interview, with images taken by Alex Royle, is on their Journal. "California born, Brooklyn based Simone Bodmer-Turner’s ethereal hand built clay work feels like it comes from another place and time. 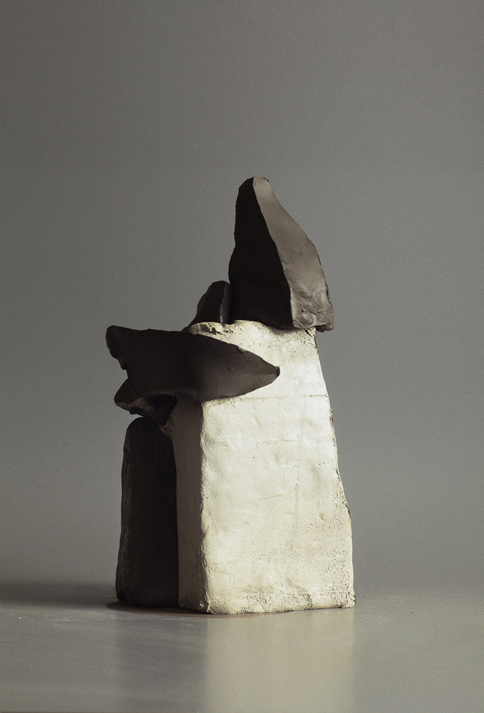 Inspired by the longstanding clay techniques that many communities throughout the world used long before her, she pays homage to ancient forms in her work. We sat down with Bodmer-Turner to talk about her time spent in Mexico and Japan, wearing all white, and the seasons changing. I spent the ﬁrst 10 years of my life in Berkeley, California, and then moved to Manchester, Massachusetts and went to middle and high school there. My family is still there and I spent a couple of summers working in Gloucester, escaping the city heat. 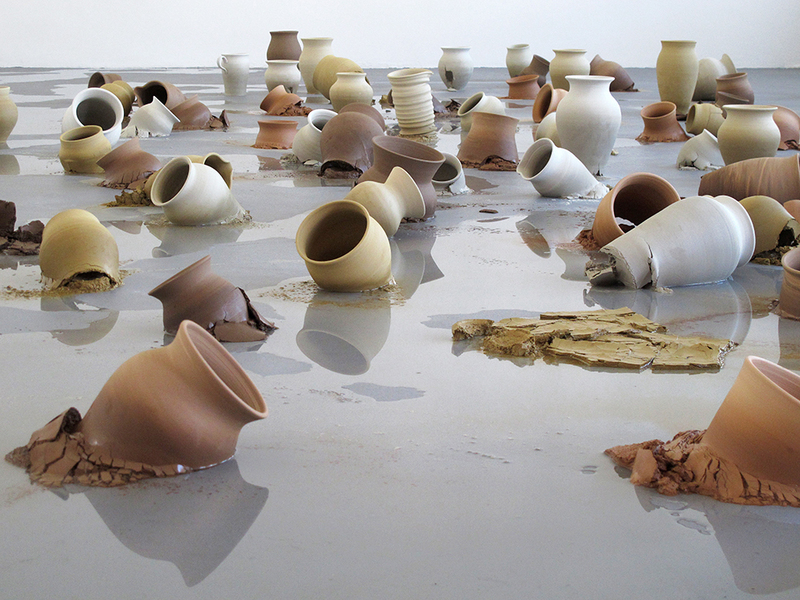 How did you ﬁnd your way to ceramics ? I grew up drawing with charcoal and oil painting, both of which are very messy practices. 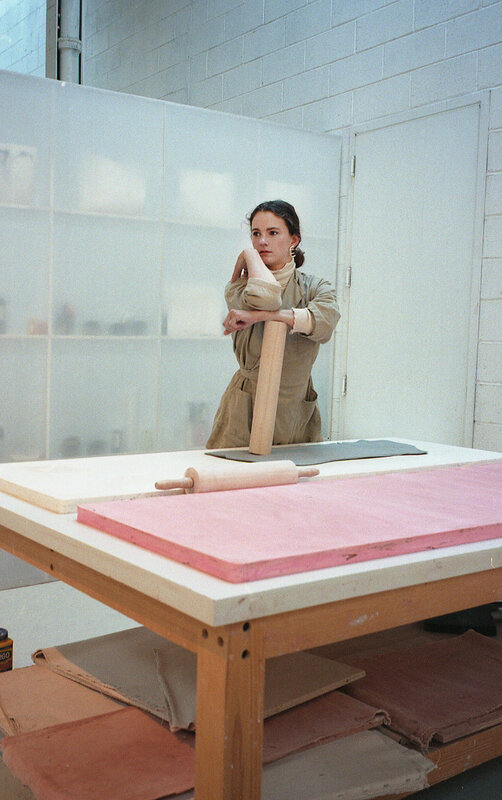 When I was living in a tiny apartment shared with two friends in Williamsburg I wanted to get back to a creative practice without making a mess of our space, and a clay studio happened to be right around the corner. I started taking classes there, and then became a member, and the rest just unfolded very naturally. I realized quickly that the wheel wasn’t for me - it didn’t lend itself to being as tactile and malleable an experience as I was looking for. As I became more committed to my own practice, I began reading about the history of the medium and became very attached to the traditional methods of hand building using coils and slump molds all of which I ﬁnd much more physical of a practice and more romantic than an electric wheel. You have been very inﬂuenced by your time in both Japan and Mexico - can you tell us a little bit about that ? Though people imagine Japan is the place to go to train under a master, my work was more independent there, something I very much needed at the time to explore my inclinations in form and style, whereas Mexico was the place I worked under a master. The potter I worked with, Ruﬁna, and her sisters had been making pots since they were 6 years old and had learned their craft from their mothers and their grandmothers in Atzompa, a short drive outside of Oaxaca city center. 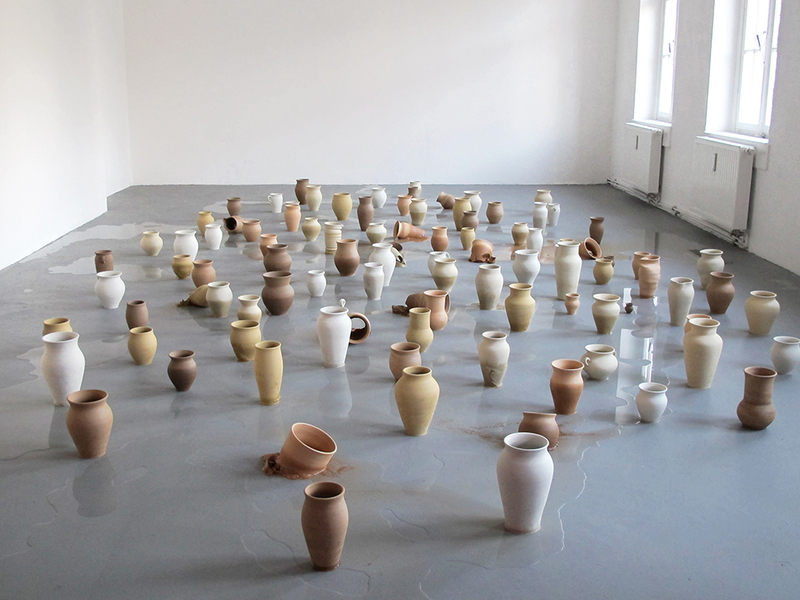 They were incredibly skilled and had a profound knowledge and intimacy with the clay. Though the cultural experience in Japan was perhaps more formative for me - greatly in part to the fact that I was living there three months longer than I was in Mexico - my time in Oaxaca was incredibly formative stylistically and technically. The pottery there, and generally in Central and South American, is still made the traditional way through various hand building techniques. Rather than being looked down on for my hand building tendencies, as I’ve experienced in many pottery communities in the developed world that favor the more perfect wheel thrown forms, my style was embraced in its familiarity. I learned many building and burnishing techniques from Ruﬁna and her sisters, but what I really learned was not to be afraid of the clay, to handle it more forcefully in order to shape it into the desired form. I remember squirming while Ruﬁna literally beat one side of my pot with her hand to get it symmetrical and took a machete to another pot to carve down imperfections. I took a supply of jicaras home with me and have been carving and burnishing my pots with them to get a smoother surface than my earlier work. I’ve started working with sculpture body which has a lot of grog, which is similar to the clay bodies they dig and mix in Atzompa. 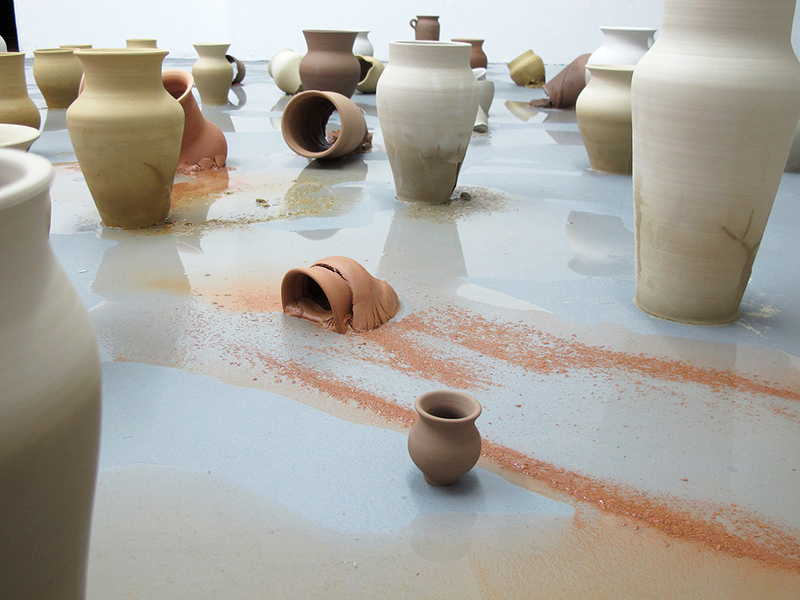 The ﬂexibly and strength of that clay has made me work less timidly. 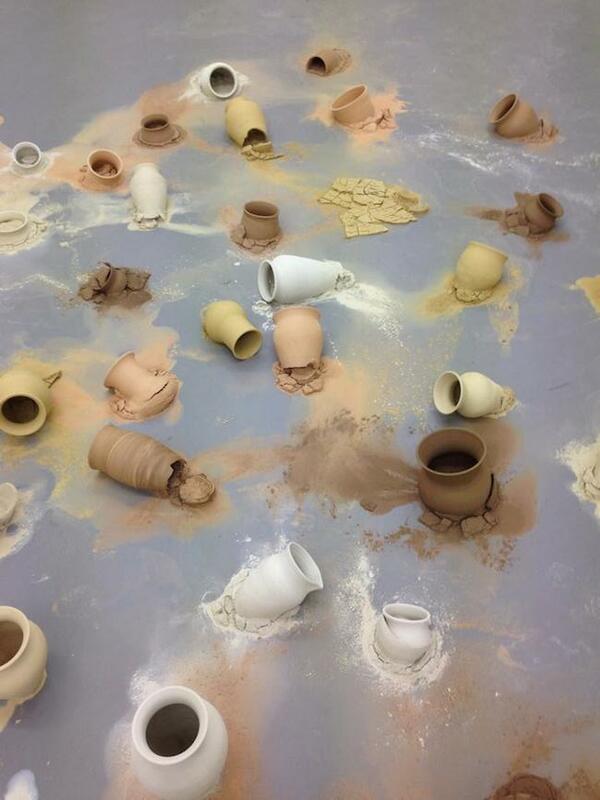 Is there somewhere else on your bucket list where you would want to study ceramics and that culture’s process? West Africa. I ﬁrst became interested in the traditional craft of that area of the world when I was studying textiles. Burkina Faso has some of the most incredible indigo I’ve ever seen. Indigo got me interested in the place, but then I started reading about their ceramic traditions which are very diﬀerent from the coiling I was learning in Atzompa, though it is practiced in diﬀerent areas of Mexico. In addition to coiling, West African potters use slump and depression molds - slump meaning a pancake of clay is ﬂattened and then thrown over an upside down pot and shaped over it to get the curve, then ﬁnished with coils. A depression mold, and this is the method that really mesmerizes me, uses a shallow inverted sphere carved into the ground to shape a huge lump of clay with a mallet, thinning it out in the curve of the depression to shape the belly of the pot. If you’re curious, YouTube Christopher Roy’s video “African Pottery Forming and Firing.” If you’re impatient, forward to the ten minute mark (and note the shape of the mallet! what a form!). I would love to learn how to do this. You tend to always wear white, and work almost exclusively in white, what is it about the color that is so compelling to you ? I believe in a uniform - how I present myself to the world feels like an extension of my work in a way. I had been moving towards all neutral tones for a while and committed fully when I went to Georgia O’Keefe’s show at the Brooklyn Museum last spring. The work she made, the spaces she lived in and worked in, and the clothes she put on her back - often pieces she made for herself - all reﬂected a modern aesthetic which was very radical and powerful for a woman to cultivate all on her own. I came home from the show, emptied my closet of all the color I never wore but felt guilty about owning, and donated it. I’m starting to mix in some earth tones and patterns now though. Everyone is very confused but I’m having fun. For practicality sake, white also works really well with this medium. The clay I use is a light body and the glazes I use are also in the neutral spectrum so when I unavoidably get it all over me when I’m working, it’s hard to tell. In terms of the palettes in which I work, I had always wanted to keep it neutral while I ﬁgured out the form I was interested in so that the glaze didn’t distract from the shape and feel of the piece. Then it just kind of stuck, and made forms that were traditional feeling in shape feel much more modern, which I liked. I’ve dabbled in texture and developed my own crater glaze (which now lives at my old studio Gasworks in South Slope), and am planning to get back to that once I’m able to start working on a body of sculptural work. What are you currently listening to, reading, watching? I’ve been listening to the Call Me By Your Name soundtrack almost daily. It’s always what I put on when I get to the studio to ease me into my practice. I only wish a recording of the father’s speech was on there as well so it could get better ingrained into my brain, but then perhaps it would cease to give my goosebumps when I’m reminded of the lines “our bodies and our hearts are given to us just once…” I also listen to a lot of books because I spend so much time working with my hands. I just ﬁnished Orwell’s 1984, because it felt important to revisit. I’m usually reading multiple physical books at once and which one I sit down with depends on what I’m needing. I’m currently switching back and forth between Sapiens - which is an endlessly fascinating and disheartening examination of our species, and Bernard Leach’s adaptation of Soetsu Yanagi’s essays about Japanese esthetic and values in The Unknown Craftsman. I also keep Eric Mindling’s Fire and Clay: The Art of Oaxacan Pottery next to my bed if I’m ever lacking inspiration. This is perhaps the best book I’ve ever found on traditional hand-building and was made in collaboration with the collective of potters I was working with in Oaxaca. Any daily rituals you have ? With the onset of spring, I’ve been rising early with the sun, making lemon water, and meditating for 10-20 minutes. Sometimes a short yoga practice if I’m feeling energetic. Then I make coﬀee and try to do something quiet while I drink my cup like watering the plants, reading a couple pages, or adding to the rows of stitches I’m constantly embroidering onto my favorite linen shirt to keep it together as it perpetually rips. When I’ve composed myself internally, then I can put on on NPR, put my eyeballs (contacts) in, and start to get oiled and dressed to bike to the studio. Of course there’s many mornings when this doesn’t go exactly as planned, but I’m getting better at carving out this time for myself in the morning. What do you do to ﬁnd your way our of a creative rut ? I am fortunate that ruts are rare lately, it’s the time that’s scarce. I have entire notebooks full of sketches of non functional work I’m dying to have the time to work on. My mind is always wandering to new forms, when it’s not designing living/studio/garden space. However, in some of my past creative ruts I’ve run away to other countries to attempt to ﬁgure out what moves me in terms of my work. It’s a fool proof method, but a privileged one. Finding the energy to go to the studio every day can be hard to muster. But I’ve learned that the hardest part is getting myself there, and once I’m there the clay picks up it’s side of the bargain and keeps me there for hours when I was only planning to glaze one piece and then take myself out to lunch. Whenever I’m feeling uninspired to work, I have to remind myself how lucky I am to be making a living oﬀ this humble practice that is so endlessly interesting and fulﬁlling in a city as wild and competitive as New York. Your favorite things about the seasons changing ? My favorite time of year is around October when summer fades into fall and everything is slowly getting ready for hibernation. The smell that time of year…of the leaves drying out and the soil getting turned over one last time to be put to bed. The promise of rest. It’s also my favorite time of year for vegetables - winter squash, brassicas, the canning of summer’s excess tomatoes and the drying of persimmons. After such a slow transition into warmth this year, it feels like a challenge to the gods to admit I’m not usually partial to spring, but this is the ﬁrst year I’ve really celebrated the ﬁrst crocus coming up and the longer hours of daylight." I have been meditating on the idea of deconstructing and breaking my own work in a performance piece for the last two years. I've come close to forming a solid plan of execution many times, but circumstances, location, and the way I want to present the piece always meld into a new iteration of the piece faster than I can act on the impulse. It came to me in a moment of deep unrest with what I was making, and wanting to capture the sentiment around a potters attachment to their intention for their piece despite obvious lack of control in how it takes its final form. As I moved into a place of finally feeling like I was proud of what I was making, the intense need to create this cathartic act of destruction and release of control (or is it the reassertion of control?) subsided. I am afraid that moving past the moment when this need to break, to destroy, to heal held such power over me might weaken the emotion in the performance, but I am hoping that in 2018 the way forward becomes clear and I am able to bring this creative/destructive/cathartic act out of hibernation into fruition. I'm also afraid someone else besides Ai Weiwei, because that's different, will do it first. So perhaps this post is really just a grasping attempt to mark that I had and have this intention. 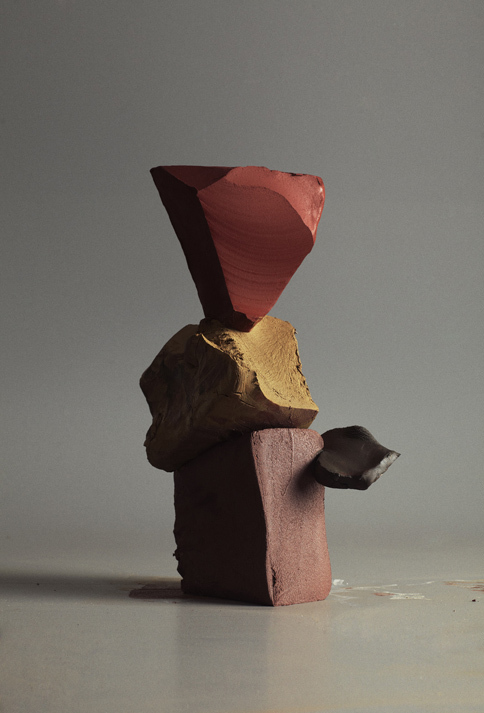 A series of images of clay and clay tools to publicize the Tate Modern's upcoming 'Interpreting Giacometti in Clay' course, run by the members of Clay Collective. Set Design by Jess Murphy, shot by Charlie McKay. 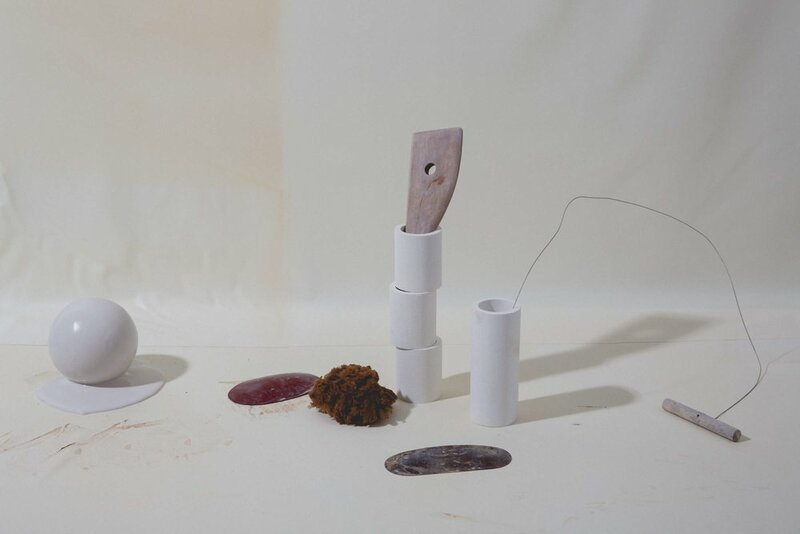 This collaboration between ceramicist and performance artist Romy Northover and photographer Shanita Sims moved me months ago. I am constantly toying with the idea of using clay as part of my practice in it's messy, rawness rather than a medium to shape and harden into a finished form. As I gather pieces of work around clay into this strange and unfamiliar, but possibly exciting, internet home, this is one I wanted to be sure to share. Full Story at No. 6. 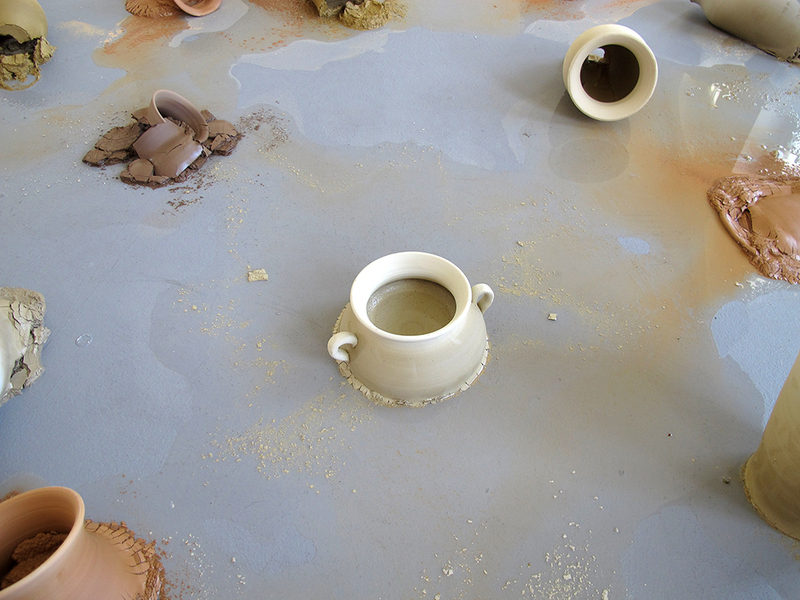 A brief and infrequent account of happenings, clay and form related things of interest and inspiration, and feelings.